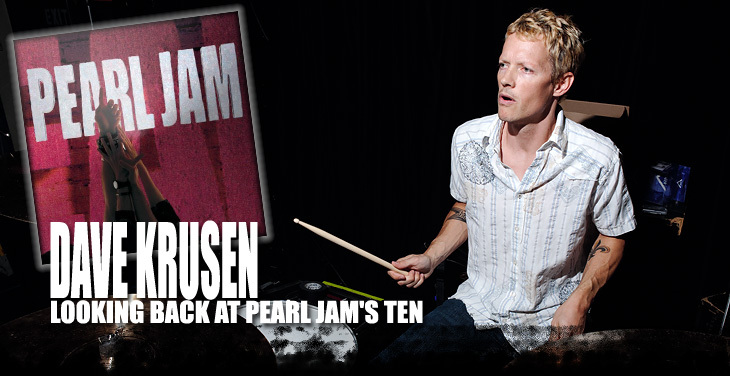 Vater’s Artist Relations Director, Chad Brandolini, recently caught up with Artist Dave Krusen about the re-issue of Pearl Jam’s breakthrough debut, “Ten”, eighteen years after it’s original release. Dave spoke about the tracking, drum set up and the writing of what became an iconic album, selling more than 12 million copies. Give a brief history of how you got involved and joined Pearl Jam. I had friends that had a band called Son Of Man who used to play shows with Mother Love Bone, Soundgarden etc. They heard Jeff (Ament) and Stone (Gossard) were looking for a drummer for something new after Mother Love Bone disbanded. I called Jeff, who was in the phonebook and he invited me down to jam. We had a very cool sound from the get go. That was the beginning of Pearl Jam. What was the songwriting process for this set of songs and how old where the songs when “Ten” was recorded? Stone had a few songs, not sure how long he’d had them. Not long though. We started working those up, while Eddy was still in San Diego. I didn’t even know they had a singer, but he was hard at work on lyrics down there. (I didn’t ask a lot of questions). Then we started working on some ideas that Jeff had, things like that. Some stuff just came from spontaneous jams. The song “Release” was one like that, that came from a jam. It all came together quickly and easily from what I remember. What was your drum kit set up like? Did it stay consistent from track to track? Yeah it stayed about the same the whole time. The tracks, “Alive”, “Wash”, “Brother”, “I’ve got a feeling” were all from the demos. That kit used on those songs was my kit at the time; a Tama Swingstar , 22×16, 11×12, 13×14, an old 5×14 Ludwig Supraphonic snare. Pinstripe heads on all the drums but an Ambassador on the snare drum. Sabian 18″ crash, 20″ Zildjian Scimitar Ride, 20″ AA Sabian China and Paiste 14″ 404 Hi-Hats that were cracked. For the record, I borrowed a Ludwig maple kit. 22×18, 11×12, 13×14 and a Noble & Cooley 5×14 maple snare. Cymbals were Sabian 20″ AA Heavy Ride, 18″ AA Thin Crash, 18″ HH Thin Crash, 20″ AA China, 13″ AA Regular Hats and a 15″ metal crasher. White coated Ambassador on kick. CS black dot the snare. We had coated ambassadors on toms, but switched to pinstripes. How many tracks in total were recorded for the “Ten” session? Whoa, not sure. A LOT!!! I do remember the 2″ tapes we had finished, lined up against the wall. It stretched on for quite a ways. Maybe 20, 25 songs all together. Maybe more. Did the band track one song, complete it and then move to the next, or did you go through and record all the drum tracks in a row before the other guys put down their parts? We did most of the record live as a band. They did do some vocals, some solos, bits and pieces as overdubs. But, the bulk of every song was done before we moved on to the next. Did you record to a click? We started with a click for the record. There might be a couple that it worked on, “Jeremy” maybe. But for the most part, we’d been playing most of the tunes live, for long enough, that they had to breathe in order to work. I was pretty green back then and “Even Flow” suffered from too much fluctuation. But, “Alive”, “Once”, and most of the songs were just us tearing through them. How many takes did you do for each song on average? I think most of the songs were only a handful of takes. But “Even Flow”…like I said, it was really tough for me. I don’t know why. Not sure why we didn’t use that one from the demo as well, but I know it felt better. How many days did it take for the drum tracking? How many days for the entire album to be complete? Two weeks to do the drums. The whole album took about a month and a half I think. “Oceans” has some cool percussive elements. What was used on that track? We originally tracked drum kit on that song. Then I added three tympani parts. I remember we were all in the control room listening to the tympani part with the drums muted. Someone commented how cool it sounded like that, so we kept it that way. I’m glad we did. Lost Dogs (released in 2002) has some great stuff from that session that hadn’t seen the light of day. “Brother”, the song being released as a new single as part of the re-issue of Ten, is on there without vocals. There’s the Mudhoney tune we did, (“Touch me I’m sick”), a Free song, a Beatles tune. It’s cool now to hear how we interacted musically. It was pretty damn cool! At that time, what were the expectations going into this album? Not sure what the expectations were. The band was trying to create a sound that was timeless was the feeling I had. Did you ever imagine that the songs would still be relative all these years later? We just wanted to make a great record. I remember how impressed I was with the songs, the sound coming back on the speakers in the control room. But I’m not sure any of us knew how they would be looked at down the road. When writing and tracking “Jeremy”, did you or the band ever think that the song and/or video would cause so much controversy? I didn’t know what the song was really about until after I saw the video. From what I remember about Eddy, he wrote that about what he was feeling. I don’t think he wanted to create controversy, but he did want to talk about something that struck a chord within him. I think he’s a great writer because he doesn’t fear others judgment about such things. How do you feel when someone says how much of an influence “Ten” made on the music industry or in their personal life? I still get people coming up to me telling me how they love that record, and it’s a great feeling! Mostly because I know how the records I loved growing up have helped me through tough times and how they made me feel connected to something. I love being a part of that, it’s what I always wanted to do. Looking back and listening to the tracks, are there any songs, if given the opportunity to go back, that you would play any differently? “Even Flow” for damn sure! Other than that, “Breath and A Scream”. I’m happy with most of it though. If you had one song to pick from on “Ten” that you feel best represents you as a musician, what song would that be? What was the concept behind the album cover and artwork? I feel like it was unity. Jeff built this massive Pearl Jam wood cut-out. That thing we’re standing in front of was actual size! Jeff’s an amazing artist through and through. Lately I’ve been keeping busy with several different projects. I’ve been recording and playing live with The Kings Royal, Puppies And Kittens, Toy Robot, Shelby, Ida Maria, La La La Birdtime as well as a couple things still under wraps. Also, my nine year old son Jagger, (who also uses only Vater sticks), has been shredding some serious stuff on the drums. Keep an eye out for him!